Performers include: Keith Ferguson, Sean Marquette, Grey DeLisle, Tom Kenny, Phil LaMarr, Candi Milo, Tom Kane, and Tara Strong. In this animated universe, imaginary friends become physical beings after kids imagine them. But by the time a child turns age seven or eight-years-old, they typically abandon the need for these imaginary friends. An elderly woman, Madame Foster (Candi Milo), has opened up a foster home for these abandoned imaginary friends. She a wise woman and lives life to the fullest. She has never abandoned her own imaginary friend, Mr. Herriman (Tom Kane). He’s the size of a man, but is a bipedal rabbit and often wears a tuxedo coat, stovepipe hat, and monocle. Frances “Frankie” Foster (Grey DeLisle) is Madame Foster’s 22-year-old granddaughter. She acts as the home’s housekeeper and manager and is friendly and easygoing. Mac (Sean Marquette) is an intelligent 8-year-old boy who lives with his mother and older brother. He seems to always know what to do when a problem arises. Mac created his polar opposite imaginary friend, Bloo (Keith Ferguson), when he was just 3 years old. Bloo looks like a domed cylinder, is very egocentric and superficial, and takes advantage of others. Wilt (Phil LaMarr) is a friendly imaginary friend, and is “big brother-like.” He’s tall and red, with a stub of a left arm and crooked “wonky” eyestalk, the results of basketball game injuries. He’s courteous to a fault and apologizes constantly. 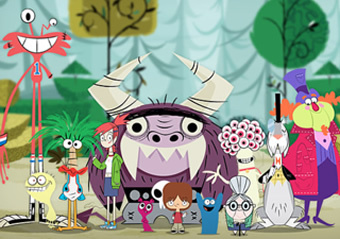 Eduardo (Tom Kenny) is an imaginary protector friend who speaks in a loud Spanish accent. He weighs in at more than 500 pounds and has purple fur with big horns. Despite his large size, enormous strength, and menacing demeanor, he is also docile and compassionate. Coco (Candi Milo) is so named because she can only speak or write the word coco. She’s a bird/airplane/palm tree with a talent for laying small plastic easter eggs that contain a variety of objects. She is perceived to be intelligent, principled, and kind.